A hybrid mattress has an innerspring system covered by memory foam or another type of padding. Hybrid mattresses are intended to provide the sturdy support and contoured support. A real hybrid mattress has at least an inch and a half of padding above the box spring. Some hybrid mattresses use two or more layers of foam, such as a layer of latex foam and a layer of memory foam. Latex foam is spongy and cushy, making the surface soft, while the memory foam improves pressure point relief. In other hybrid mattresses, the bed combines gel foam and memory foam. A few models have a separate layer of micro-coils on top of a thicker box spring. Some hybrid mattresses have traditional coils while others have micro-coils. What Are the Pros and Cons of Hybrid Mattresses? -Hybrid mattresses have better pressure relief than conventional mattresses, something that improves as they add to the number of coils. -Hybrid mattresses allow for more air flow than memory foam mattresses; this matters if you’re prone to overheating in bed. They’re much cooler than all-foam beds. However, this depends on the brand. Some hybrid mattresses have the same issue with heat retention as all-foam beds. -These mattresses are heavy compared to an inner spring mattress. And unlike foam mattresses, they are rarely able to be compressed down to lower the cost of shipping them to your home. -These mattresses have much better edge support than coil mattresses that tend to sag on the sides even if it is still comfortable in the middle. -One benefit of hybrid mattresses is the fact that they cost less than beds made entirely out of memory foam. The cost of the mattresses depend in part on the thickness of these costly layers while the complexity of the design also increases the cost. Some hybrid mattress manufacturers put layers of wool or bamboo or other natural materials to try to charge more for the “green” label. -Hybrid mattresses capture some of the bounce caused by someone tossing and turning or getting out of bed. It isn’t as good as separate mattresses. Micro-coils in the best hybrid mattresses enhance this benefit. -These mattresses are quieter than coil mattresses. This benefit is greater when you have micro-coils, especially if each coil is “pocketed” or wrapped in cloth. -One of the problems with hybrid mattresses is that they don’t last longer than a mid-grade inner spring mattress, despite costing much more. -Hybrid mattresses last longer than mattresses made only of memory foam. They lose about 5% of their resiliency whereas latex foam loses a fifth of its resiliency and poly foam loses half of its resiliency. You don’t risk sinking into the hybrid mattress and feeling like you’re stuck in the mud when you try to get out of your set sleeping spot. The Everest model hybrid mattress by Mattress America is an affordable hybrid mattress. It is the best hybrid mattress for someone who is on a budget and wants the basic benefits of hybrid mattresses. One benefit of this particular product is the ability to choose an extra “plush” layer built-in instead of putting another mattress pad on top of it. The manufacturer is also unusual for offering everything from full to California King sizes, in addition to the standard King size. The twelve inch mattress has a minimal foam layer on top. It doesn’t have issues with heat retention. It does take one to two weeks to fully decompress, though you can lay on it almost immediately. You can use it on a platform bed without a box spring, but you’ll want a box spring for maximum support.One issue with this manufacturer is lack of support. If they send you the wrong sized bed or it is damaged in transit, you’re not going to get help from the manufacturer. This hybrid mattress has a strong innerspring mattress covered with a layer of gel and memory foam. It actually has five layers of foam, one of which is gel foam. It is relatively cheap for a hybrid mattress. The unusual bamboo fiber cover makes it breathe. If you’re allergic to latex, this hybrid mattress is a safe, hypo-allergenic alternative. A side benefit of the bamboo outer layer is the near elimination of the chemical smell that comes with new memory foam mattresses and accompanies many hybrid mattresses. The individually wrapped coils gently respond to your shifting weight without making noise. The foam layers help keep your spine aligned and eliminate pressure points. The mattress is able to compress for affordable shipping. One of the downsides is that the mattress is still quite heavy and costs a lot to ship even when compressed. The manufacturer provides a basic ten year, limited warranty. The mattress comes in sizes from full to King and is available in the hard to find California King size. This is a Tempur-pedic brand mattress with the patented and excellent quality Tempur-material. It adapts and supports your body, so there is no “stuck in mud” feeling after you’ve been in the bed for a while. It provides complete pressure relief and absorbs motion so one person getting out of bed won’t disturb the other. It is medium to firm. The top layer of the bed has a moisture-wicking fabric to help you stay cool; in essence, the bed is designed in and of itself to reduce the heat retention problem you’d otherwise get even with some hybrid beds. That’s aside from the cover you can zip off and wash or replace if worn. One of the benefits of this mattress is that you can find it in almost any size. If you like the mattress, you can buy twin, twin XL, full, queen, king, California king and split California king sizes. The downside of this mattress is cost. It is very expensive. The free delivery that typically comes with it only partially offsets the price. This hybrid mattress is designed for those who need a firm hybrid mattress, whereas everything else on this list is medium to medium-soft. The gel memory foam solves the heat retention problem that many other hybrid mattresses have. Unusual among hybrid mattresses, the three inch foam edge lets you sit on it without it sinking or deforming long term. It has very little motion transfer. This hybrid mattress is more affordable than the Tempur-pedic brand mattress while offering almost equally good pressure point relief for those with joint pain or who need excellent support to avoid back pain when they awaken. This mattress is available from Twin XL sizes to King size. You can find California King versions of this mattress from some retailers. If you already own a Sealy or other adjustable bed, this mattress will fit the bed frame. You have a wide selection of bed foundations that you can use with this mattress.The manufacturer has a basic ten year limited warranty. This hybrid mattress is middle of the pack in terms of price. At eleven inches, it is one of the thinner mattresses, perfect for those who want a hybrid mattress that’s as low as possible.It has a very high coil count, with more than 1000 individually wrapped coils. One issue that creates problems for some buyers is the firmness. It is medium firm, but it is labeled as medium soft. It works for back sleepers, but it doesn’t have the support side sleepers need. 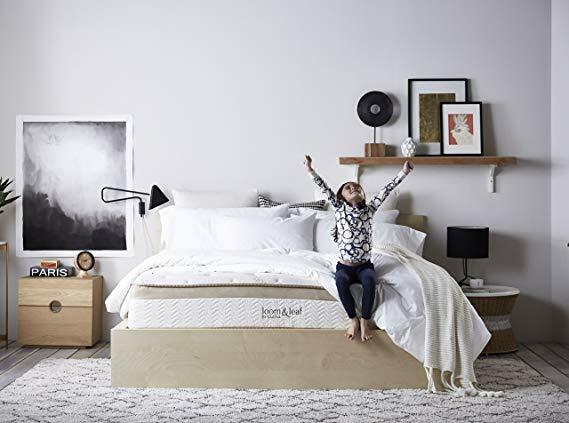 This hybrid mattress is better than a standard box spring mattress in terms of pressure points, but you’ll want to look at other hybrid mattresses on this list if you’ve got a bad back or arthritic joints. One of the downsides of this mattress is that it emits a slight chemical smell for weeks. The mattress has a removable cover, but washing that does not completely eliminate this smell. Conversely, it is durable and works well for those who are happy with it.